While the U.S. East Coast prepares for Hurricane Florence, the U.S. state of Hawaii is feeling the effects of Tropical Storm Olivia. 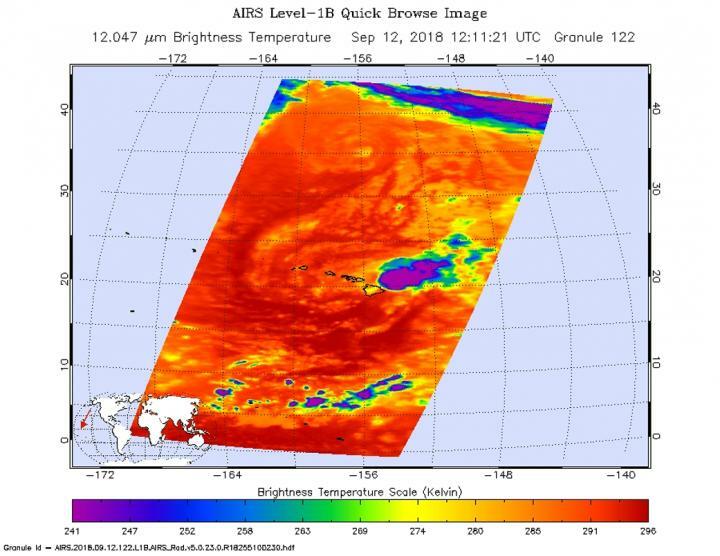 NASA's Aqua satellite provided an infrared look at Olivia that showed wind shear was affecting it before landfall. On Sept. 12, a Tropical Storm Warning is in effect for Oahu, Maui County…including the islands of Maui, Molokai, Lanai, and Kahoolawe. Interests in the Northwest Hawaiian Islands should monitor the progress of Olivia. When NASA's Aqua satellite passed over Tropical Storm Olivia on Sept. 12 at 8:11 a.m. EDT (1211 UTC) was closing in on landfall in Hawaii. The Atmospheric Infrared Sounder or AIRS instrument analyzed the storm in infrared light which provides temperature information. Temperature is important when trying to understand how strong storms can be. The higher the cloud tops, the colder and the stronger they are. Vertical wind shear was affecting Olivia and pushing storms east of its center. In general, wind shear is a measure of how the speed and direction of winds change with altitude. Wind shear can tear a tropical cyclone apart or weaken it. AIRS saw coldest cloud top temperatures were as cold as minus 63 degrees Fahrenheit (minus 53 degrees Celsius) pushed east of the center. Storms with cloud top temperatures that cold have the capability to produce heavy rainfall. That rainfall is affecting Hawaii today, Sept. 12. The CPHC said "Showers will continue to increase over the main Hawaiian Islands today. Olivia is expected to produce total rainfall accumulations of 5 to 10 inches in some areas, with isolated maximum amounts of 15 inches possible, especially in higher terrain. This rainfall may produce life-threatening flash flooding. Up to 6 inches of rain has already fallen over parts of Maui." At 11 a.m. EDT (5 a.m. HST/1500 UTC), the center of Tropical Storm Olivia was located near latitude 21.2 degrees north, longitude 155.7 degrees west. That's about 55 miles (90 km) east-northeast of Kahului Hawaii. Olivia is moving toward the west near 12 mph (19 km/h), and this motion is expected to continue through this morning. A motion toward the west-southwest is expected later today, with an increase in forward speed. This general motion is then expected to continue the next couple of days. Maximum sustained winds are near 45 mph (75 kph) with higher gusts. Some weakening is forecast during the next 48 hours.